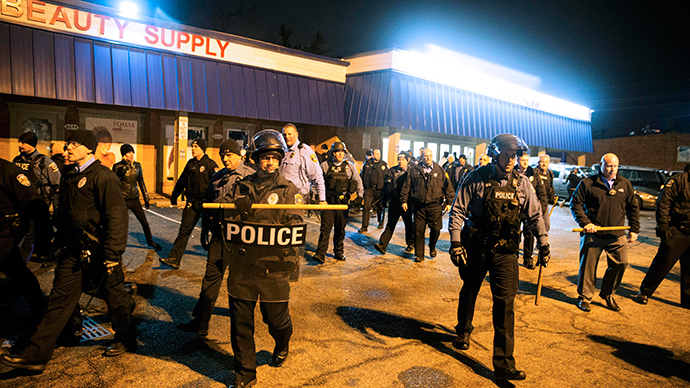 Racist jokes prompt dismissal, 2 probes in Ferguson Police Dept. One Ferguson Police Department employee has been fired and two others have been placed on leave after federal authorities identified them as responsible for writing racist emails, the mayor of the city said. Ferguson Mayor James Knowles made the announcement at a Wednesday evening press conference and the decision came after the US Justice Department tagged the three specifically for having made racist remarks in city emails. The fallout comes as the Justice Department issued a 100-page report that found systematic racial discrimination by the Ferguson police officials and the court system against African Americans. Mayor Knowles said the city “must do better”to address racism. Knowles said the two city workers on administrative leave were under investigation. The DOJ report cited racist emails exchanged by Ferguson city employees as examples of a culture that supported discriminatory behavior. “Our review of documents revealed many additional email communications that exhibited racial or ethnic bias, as well as other forms of bias. Our investigation has not revealed any indication that any officer or court clerk engaged in these communications was ever disciplined,” the report said. There were no accounts of senior officials asking others to stop sending the emails or any indication of reports being made about inappropriate emails. – An April 2011 email depicted President Barack Obama as a chimpanzee. – A December 2011 email included jokes that are based on offensive stereotypes about Muslims. According to the DOJ report, each of these email exchanges involved supervisors of the Ferguson patrol and court operations. A DOJ official told reporters that some of the emails were sent by people still involved in helping to negotiate a settlement with the agency. The DOJ declined to identify them. Regarding the discoveries made by federal officials, Attorney General Eric Holder said that a “highly toxic environment” existed between Ferguson police officers and the city's African American residents even before the death of 18-year-old Michael Brown. The unarmed teenager was killed by Officer Darren Wilson in a confrontation that set of weeks of protests locally and nationwide. “It's not difficult to imagine how a single tragic incident set off the city of Ferguson like a powder keg,” Holder said. He added that excessive force was overwhelmingly used against African American residents, noting that only African Americans were bit by police dogs. Holder said there was “no alternative explanation” except racial bias exists to explain it.